ASMR, short for Autonomous Sensory Meridian Response and also known as whisper chills, chills response, is a pleasant tingling sensation that typically starts in the head and the scalp and spreads downward into the body. It is triggered by sounds, touch, smells and pictures. Upon experiencing ASMR, many find themselves relaxed and partially sedated. I’ve noticed similar descriptions elsewhere, and it seems that SMELL is always left out. I have found (and so have others I have communicated with about ASMR) that smell can be a VERY powerful ASMR trigger. Sometimes cigar/pipe/cigarette smells from across a field or from a neighboring car, or someones perfume/aftershave is tingle inducing in and of itself. Just wondering why this powerful ASMR-friendly sense always seems to be left out? Thanks for mentioning that. I actually did not even think about including smell as an ASMR trigger, but I remembered back to when I was a child and how certain smells would give me tingles. Glad I’m not the only one. If you get what I call the holy trifecta of ASMR — 3rd party touch, the right voice, and the right smell — you are, as you can well imagine, in a state approaching nirvana. Yeah, I’m hoping that as ASMR gets more popular, there will be ASMR clinics, sort of like massage clinics, where you can choose what triggers you would like to experience. 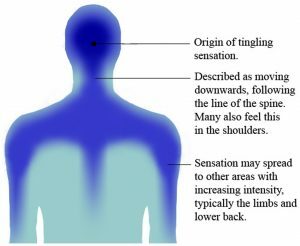 The reduced irritability is from the calming effect of ASMR. Though, it might only last for the duration the ASMR is experienced.